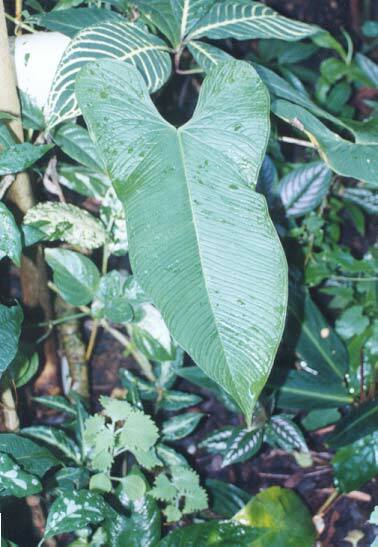 Anthurium argyrostachyum Sodiro, Anales Univ. Centr. Ecuador 15(108):11. 1901. Distribution: Northwestern Ecuador and possibly Southwestern Columbia. Description: Epiphytic herb. Stem, sub-scandent, internodes 2.5-3 cm long; Leaves petioles, terete, leaf blade, subcoriacious, hastate to saggitate with large posterior lobes, numerous parallel secondary veins.